Review date: 7 April 1999. 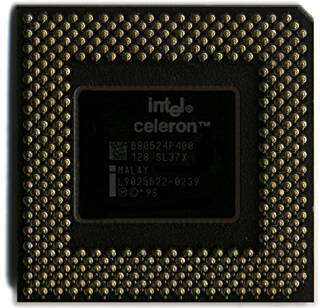 The PPGA (Plastic Pin Grid Array) package for Intel's low cost Celeron processors is a sensible enough choice on their part. 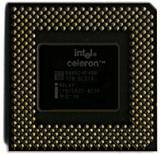 The earlier model Celerons fit into the same Slot 1 processor connector as the Pentium II and Pentium III, but they don't have any need for the extra processor board real estate the Slot 1 package offers. The P-II and P-III have outboard Level 2 cache RAM sitting on either side of the main processor chip on the circuit boards that lurk within their plastic cartridge, but the less impressively enclosed Celeron has no Level 2 cache at all (for the original models) or 128Kb of Level 2 cache built into the CPU itself (for models from the 300A onward), so there's really no reason for it to live on a slab of fibreglass. A simple square chip, like the original Pentium but with more pins, would be perfectly adequate. That's what the PPGA Celerons are. They look pretty much like an ordinary Pentium, at a glance, but come with a more impressive heatsink and fan setup, and plug into a new kind of socket, dubbed "Socket 370". Socket 7, by the way, is what standard Pentiums use. The early 5 volt 60 and 66MHz Pentiums used Socket 4, and Socket 5 supported only 75 to 133MHz Pentiums. Socket 6 was an unpopular modified version of the old Socket 3, and was Intel's last 80486 socket design. 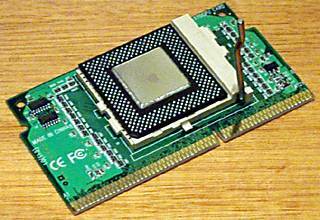 Socket 1 was the first standardised 80486 socket, and Socket 2 added support for Pentium Overdrive processors. Socket 8 is the Pentium Pro. 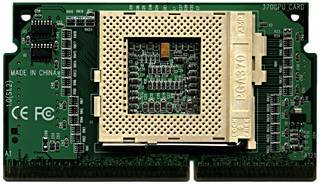 There weren't 361 failed socket designs between Socket 8 and Socket 370; 370 is the number of pins on the PPGA Celerons. When they were first announced, though, a groan went up among many PC users, who weren't keen on the idea of having to buy a whole new special kind of motherboard with a PPGA Celeron socket on it in order to use the new chips. Fortunately, it turns out that you don't have to. 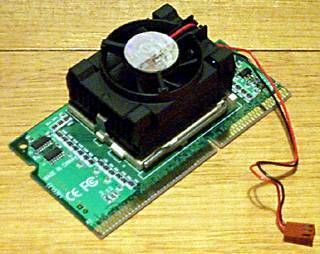 A PPGA Celeron adapter board is a simple enough creature. It's got a socket on it just like the ones on PPGA Celeron motherboards, and on its edge is a Slot 1 connector. Plug your Celeron into it and presto, it'll work with any ordinary Slot 1 motherboard. As far as the motherboard's concerned, it's looking at a plain Slot 1 processor, so your PPGA Celeron can be plugged into a motherboard that supports manual adjustment of Front Side Bus speed and processor voltage and overclocked, just like a regular Slot 1 Celeron. Some Slot 1 adapter boards have cheap tin-plated contacts on the edge connector, which can corrode when in contact with the gold contacts in the Slot 1 edge connector. Whether this corrosion is actually likely to cause any real problems over the life of the CPU is debatable, but it was nice to note that this adapter board had gold contacts. Installation is trivially simple. The PPGA socket is of the standard Zero Insertion Force (ZIF) kind; you lift a lever, drop the processor in (no force at all is needed to seat it), and swing the lever back down to lock the chip in place. Then it's just a matter of clipping the rather ferociously sprung heatsink into place. Do this on a somewhat padded surface, like a newspaper, if only because the card is likely to dent whatever it's sitting on as you bear down to seat the clip properly. Clipping the heatsink on is actually pretty easy; removing it is more nerve-wracking. Fortunately, it's actually rather difficult to seat the heatsink incorrectly, so you'll likely never have to take it off. The stock Intel PPGA Celeron heatsink isn't as expansive as the stock Slot 1 unit, but it's deeper and probably has quite similar fin area. It's also got the same excellent little ball bearing fan, although only with a two pin connector (so the fan can't report its speed to a motherboard equipped with three-pin connectors). The stock Slot 1 Celeron cooling gear serves well even on many overclocked machines, and there's no reason to suppose the PPGA version will be any worse. If you want to goose up its performance a bit, scrape off the thermally conductive pad that presses onto the CPU and replace it with a thin smear of heatsink grease, which is available from any decent computer or electronics store for close to nothing. The adapter card I checked out comes with a couple of little plastic dinguses to clip it into most Slot 1 sockets. This puts it ahead of the genuine Slot 1 Celerons, which rely on nothing but the friction of the edge connector to stop them dropping out of the slot. The edge connector actually holds quite securely, but with a chunky processor it doesn't hurt to have a more positive connection. The dimensions of the adapter-plus-Celeron combination are different from those of a standard Celeron or Pentium II, because the socketed chip and its heatsink stick out rather further. On most motherboards, in most cases, this won't be a problem, but you should check the layout of your PC before going for an adapter-board solution. If there isn't definitely a couple of inches of clearance between the fan side of the processor socket and anything else, you'll need to rethink your plans. A tight fit is bad, because it'll foul up the airflow from the heatsink fan. The no-name adapter card I checked out sells for less than $30 (Australian dollars) retail. If you buy one with a processor, you're likely to pay significantly less. The Celeron is the penny-pincher's CPU choice, but you'll have to be pretty strapped for cash for the price of a Slot 1 adapter board to make a difference to your purchasing plans.